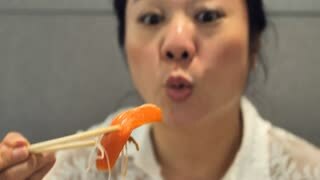 Slow motion of Happy asian woman eating japanese food. Happy asian woman sits in a cafe and eats sushi with sticks with smile face. 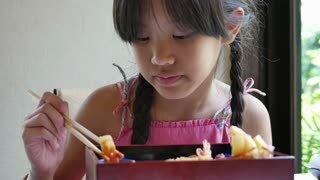 Slow motion of Happy asian boy eating japanese food. A teenage sits in a cafe and eats sushi with sticks. 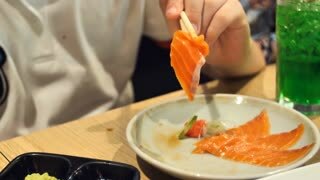 Slow motion of Happy asian family ,Mother and son eating japanese food. Happy asian family sits in a cafe and eats sushi roll with smile face.